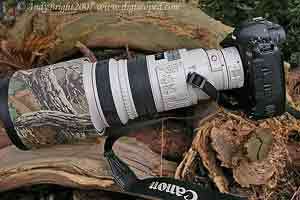 Since November of 2006, I have been using Canon equipment. For the 20 years or so before that, I was a Nikon camera user. I made this dramatic and costly change primarily for the use of extreme telephoto lenses with image stabilisation built-in. Despite rumors that Nikon would produce a 600mm VR lens, these rumors stretch back 7 years or more, and you just can't go on waiting. I hasten to add that image stabilisation has little impact on aviation photography but my first love is bird photography, and a 600mm lens + teleconverter is helped greatly by image stabilisation, even on a very good tripod. I have extensive experience with a number of cameras and lenses, and I'd like to share these view visitors to this site. Much is from my bird photography experience but is hugely relevant to aviation photography or any branch of photography that requires long focal lengths. So if you're wondering why my lenses often feature camo covering, then you now know why. The Nikon AF-S 300mm f2.8 VR . 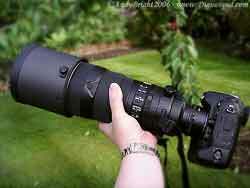 Nikon's longest telephoto prime lens to have image stabilisation (Vibration Reduction). Truly awesome and every bit as good as Nikon's older 300mm f2.8 legends. Works extremely well with the Nikon TC-17E 1.7x teleconverter. 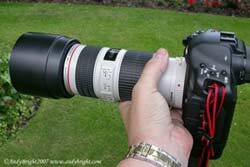 The Canon EF300mm f2.8 L I.S. USM. Probably Canon's greatest lens to date. Can even bring home the bacon with the Canon EFII 2x teleconverter. One of the mainstay lenses for aviation photography. My 'Old Faithful' the Nikon 80-400mm VR lens. Not particularly fashionable these days with its 'screw-drive' AF system, but awesome optically. I've put this lens through all sorts and it always delivered. 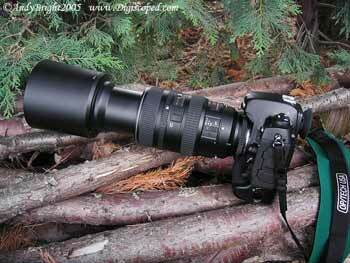 The Canon EF70-200mm f4 L I.S. USM. Sometimes you need to go wide for the big stuff and also capture the team displays and this lens seems about right to me, especially with a full frame camera.